From around January this year I’ve tried to get the column below published – in the Guardian UK where my previous column was published. Unfortunately, and even after endless cajoling via the Guardian at this end, I couldn’t get a reply which is piss poor but there you go. Martin Wolf tried for me at the FT. At least they responded – but with a ‘no’, which is fair enough given the oversupply of articles on Brexit. Anyway as it fades into irrelevance and the Brexit Brouhaha Burbles on I thought I’d pop it up here. The result of the 2016 Brexit referendum looms over the career politicians assembled in the Palace of Westminster as the black monolith loomed over the apes in the movie 2001. It’s taken over thirty months of thrashing through actual options – as opposed to the wild partisan imaginings in the campaign – for a ghastly, if entirely foreseeable realisation to dawn. Despite the people’s clear instruction to Leave, any specific way of doing so would command far less than the 48 percent vote for Remain. In the teeth of the greatest crisis of British statecraft since World War II, the institutional imperatives of political combat ensure the politicians perform rather than deliberate. Not only Corbyn, but extraordinarily enough, May has clung to fantasies about getting a better deal, though the end game will presumably see her change her tune. 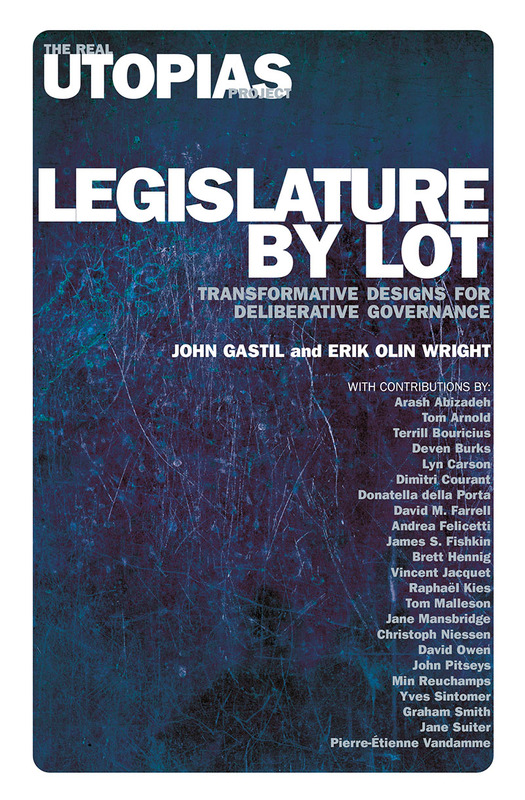 Legislature by Lot: Transformative Designs for Deliberative Governance has just been published by Verso a few days ago. I contributed a chapter, “Who Needs Elections? Accountability, Equality, and Legitimacy Under Sortition” that questions the premise of the opening chapter of the book: that sortition should only accompany an elected chamber. However, even as I’m excited by the publication of this new book, I’m thinking today about Erik Olin Wright, who conceived of the “Real Utopias” series and brought so many challenging and brilliant insights to this and his many other works, but sadly passed away recently. It was another book in this series, Deepening Democracy, which he co-edited as well, that started me down the path I’m now on. It was such an honour to meet him and get to know him – and to sing “Bella Ciao” together with him at his house a few short years ago. Le Monde reports that 500,000 people have participated in the French “Grand Debate” by submitting an online form. Of those, 55% indicated that they would support “involving citizens in public decisions using sortition”. Abstract: The issue of democratic deficit in the European Union has been present in the academic and political debate for many years now. The first natural reaction to that complex and multilevel problem was to strengthen democracy known as a representative system. The cure was supposed to come primarily through better representation of citizens’ in the European Parliament. As we know, this has not helped the EU in solving the issue. In fact, together with the dynamic increase of EP powers, the voters turn out in European elections has dropped. In consequence, the Union proposed to fight the democratic deficit with participatory democracy, and such innovative tool like European Citizens’ Initiative. Seven years of experience show that this instruments has also failed to empower and engage EU citizens. Hence, this article will try to answer the question whether deliberative democracy is the last chance to solve the issue of EU’s democratic deficit. The author will examine the pros and cons of sortition on a transnational level, and if this kind of democratic innovation has any chance to heal democracy in the European Union. The section ‘Combining mini publics and multi stage popular votes’ in Spencer McKay’s new paper ‘Building a better referendum’ presents an interesting overview of several systems where the referendum is combined with mini publics. Pairing a multi-stage popular vote with a mini-public – a process I refer to as an iterated popular vote (IPV) – may aid in bridging the gap between micro-deliberation and macro-participation. The IPV is an attempt at institutional design inspired by the notion of “designed coupling,” which seeks to “find the optimal strength of linkages between different parts of a deliberative system” (Hendriks, 2016, p. 55). 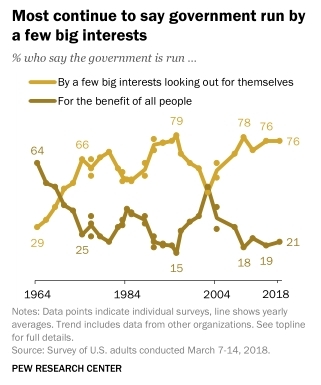 Democracy: Most Americans do not believe that government policies reflect the views of most Americans and most say that government is run by a few big interests. 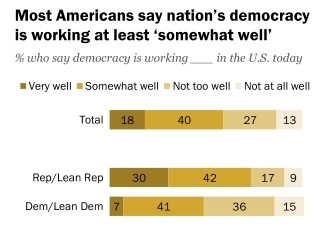 Yet most say that American democracy works very or somewhat well. On Friday and Saturday, May 17th-18th, 2019, the university of Geneva will hold a conference on the theme of “Direct Democracy v. Populism”. On Friday evening there will be a public meeting in French, while an academic conference in English will be held on Saturday. The program: PDF. Registration for the workshop is free but places are limited for catering purposes. If you would like to register please contact, before 2 May 2019, alexander.geisler@unige.ch. poster proposal by 15 April. Accepted authors will be notified by 17 April. Submissions and further information: nenad.stojanovic@unige.ch.